eupafolin, sesquiterpene lactones, euperfolide, euperfolitin, helenalin, eufoliatin, eucannabinolide and eufoliatorin. Flavonoids; astragalin, quercitin, eupatorin, kaempferol, rutin, hyperoside and others. The plant produces a positive effect on the digestive system, acting as a purgative and eliminating meteorism. Its main ability also consists in relieving pains and spasms, energizing the body and acting as a diaphoretic. 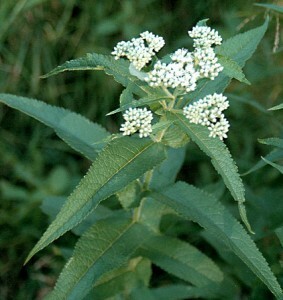 Boneset is potent of reducing or eliminating symptoms flu is associated with, including muscle pains, and high body temperature. What more, the reaction is produces is felt almost immediately. Considering its anti-spasmodic abilities, the remedy is potent of relieving several types of pain, including those induced by muscle rheumatism. The herb is also characterized by positive effect it produces on the respiratory system due to its expectorative characteristics. The remedy is able to deal not only with gas, but with constipation as well. Additional Info: Boneset is originally met in the eastern regions of North America, and commonly grows in damp areas. The root is positioned horizontally with a relatively long stem (3 feet on average) growing from it. The stem has some fuzz on it. Coarse leaves have a pointed shape. The period of blossoming lasts for two month, and commonly happens at the end of summer or at the beginning of autumn. The smell it produces is hardly felt, but the taste is sharply bitter. Preparation and intake: For infusion 1-2 teaspoons of plant extract are taken and aided by boiling water (1 cup), then left for drawing for a quarter of an hour. The hotter the infusion your drink is, the better. To treat and reduce flu fevers the infusion is consumed every 30 minutes. In form of a tincture the herb is taken in a quantity of 3 ml on average daily. Commonly combined with: Ginger, Cayenne, Elder Flowers or Yarrow are commonly mixed with Boneset to produce a stronger effect on flu. For bronchitis combine with Elecampane or Pleurisy Root. Safety: There is no data concerning the safety level of this plant.